The Government and Treasury of the British Virgin Islands has issued an exceptional numismatic tribute to the founder of the modern Olympic Games on this the 150th anniversary of his birth year. Pierre de Frédy, Baron de Coubertin (1863 – 1937) was a French educator and historian. Founder of the International Olympic Committee, he is also considered the father of the modern Olympic Games. Born into a French aristocratic family, he became an academic and studied a broad range of topics, most notably education and history. Influenced by the sporting programs in British private schools which he observed during a visit in 1883, it was thought that Baron de Coubertin looked to these programs when he began to develop his theory of physical education, he naturally looked to the example set by the Athenian idea of the gymnasium, a training facility that simultaneously encouraged physical and intellectual development. First developed by the ancient Greeks, it was an approach to education that he felt the rest of the world had forgotten and to whose revival he was to dedicate the rest of his life. To further his efforts to revive the ancient Olympic Games, de Courbetin created the International Olympic Committee in June 1894 with Demetrios Vikelas, a noted writer as its first president. The new IOC had as its first members, just thirteen founding countries. During the first meeting, the date and location for the first modern Olympic Games, the 1896 Olympics were to be held in Athens, Greece, and the second, the 1900 Olympics would be held in Paris. The commission’s proposals were accepted unanimously by the congress, and the modern Olympic movement was officially born. The first modern Olympic Games, resplendent with symbolic and historic rituals, were staged in the country of the birthplace of the ancient Games, Greece and in the capital of Athens. Opened by HM King George I of Greece (reigned 1863 – 1913) with the words “I declare the opening of the first international Olympic Games in Athens – Long live the Nation, Long live the Greek people.” with Baron de Coubertin proudly looking on and witnessing his long awaited dream become a reality. A total of nine sports over nine days were played out to an enthusiastic audience. From 1896 until 1925, de Coubertin held the position of President of the IOC, the longest tenure for any IOC president and also remained in that honorary position until his death in 1937. The coins, four in total are struck by the Pobjoy Mint, UK. They include two silver coins – one crown and one double crown, a cupro-nickel crown and a copper-struck double crown. The reverse design features an image taken from the medal awarded at the first modern Games in 1896 which shows Zeus’ face along with his hand holding a globe with the winged Victory standing upon it. This coin is available in Cupro Nickel and Proof Sterling Silver. A very special set of two coins which consists of a Copper version along with a Fine Silver version have been antique finished. During the first Olympics, winners were given a Silver medal and an olive branch, while runners-up received a Copper medal and a laurel branch. These special two coins have been produced to match the size of the original medals and are presented in a special Silver box. All the coins have been produced with a higher relief than which really makes this an exceptionally beautiful looking coin. 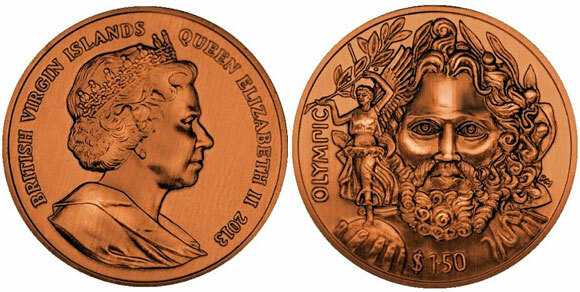 The obverse of the coin carries a fine effigy of Her Majesty Queen Elizabeth II by Ian Rank-Broadley FRBS. For more information on this and other coins offered by the Pobjoy Mint, please visit their website at: Mint at: www.pobjoy.com – information offered in English – international orders fulfilled.